Sorryyyyyyy! Even tho I am phxcdg I have spent the greater part of 33 Years in NY. I tasted bagels from 3 shops in CDG , including this one so I brought my bagels in from NYC for my brunch here. Not to sound too snobby, but PHX and MIA aren't up to par, either. They say it is the water that makes the difference. This man's bagels cost double NY's! And today, in Picard, that Mecca of French Frozen food, I saw frozen bagelsl with salmon and cream cheese all layered and packaged together for your convenience!! I am super excited! I booked my tickets and am on my way to Paris in August for 16 whole days! Can't wait to see the baguettes and perhaps the bagels. During the trip, I am meeting a friend for a couple days from Nice who needs a wheelchair - if anyone knows an accessible hotel in Paris I'd love to hear about it! Thanks! Oh no! Bagels don't sound very French at all! Give me croissants and pains au chocolat any day! This bagel shop is right around the corner from the Jeff Hotel, discovered by PHX. Go figure. I'm the Jeff is not accessible. But I know there is a website with information on that topic. I just don't know what it is. Funny that PHX is dissing les bagels francais. Or is it francaise? Fahgeddaboudit! Eric, that's so Minimal Art -- Black on White. I used to eat there when I worked in the neighborhood. Very overpriced but decent. The best I've found are actually outside Paris in Boulogne - Ben & Bagels. They will never be like NY bagels (it IS the water AND the fact that they're served fresh out of the oven) but they are decent substitutes. @PHX "Not to sound too snobby, but PHX and MIA aren't up to par, either. They say it is the water that makes the difference." LOL ! 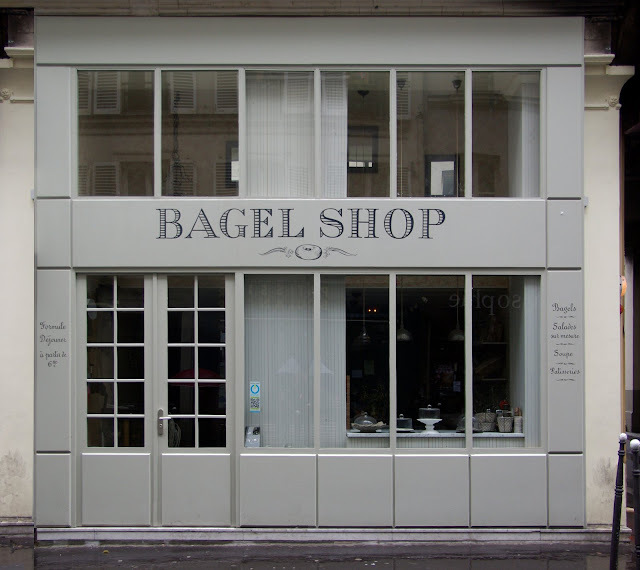 Yes I agree, but at least these shops make it easier for us to find bagels. The only alternative that I had before were the frozen bagels from Thanksgiving (the store in the 4th) and of course the ones from Picard (which are good, but they only have one kind (I only tried the plain ones not the stuffed ones). Lovely clean lines. I hope the bagels are as good as its design. I wrote today about my love affair with Paris and the fact I'll likely never be able to visit -- serendipity that I happened upon your blog today. Now following. Great work! I am not a big bagel fan, but a baguette or pain au chocolat? I would turn into a "gimme" girl! :) Bagels have their place, but in Paris I would have to stick with the real thing. Gonna have to go with PHX on this one—for whatever reason, a good NY bagel just can't be duplicated elsewhere. But I definitely like the design of this shop, and the way you shot it straight on and simple. @Mpls loves Paris -- unfortunately I can't give you suggestions for hotels, but, I got lots of good up-to-date info on your type of question in the info/blog sections at the Frommer's and Fodor's websites. Aside from random posters there are some very dedicated folks on each site who routinely post helpful answers to specific requests like yours. Check through past threads on the issue, too. Best of luck. Mmmm mmmm I can almost smell bagels baking. They are not so common wher I live but we have a French bakery that is tres populaire. That's great. Now we will eat a little different fast food. I love bagels but if in Paris, I'd like the croissants, I've had enough of bagels anyway. Great photo here Eric. Bagels are a way of life here in NYC. Doing justice to the Palais de la justice! Fire at the Eiffel Tower! Forced to be 2 minutes early! Not that bad weather after all!